For the current Norfolk Southern subsidiary, see Pennsylvania Lines LLC. The Pennsylvania Railroad (AAR reporting marks PRR) was an American railroad, founded in 1846. Commonly referred to as the "Pennsy", the PRR was headquartered in Philadelphia, Pennsylvania. In 1968, the Pennsylvania Railroad merged with their rival the New York Central railroad to form Penn Central Transportation. The ICC required that the ailing New York, New Haven & Hartford Railroad be added in 1969. A series of events including inflation, poor management, abnormally harsh weather conditions and the withdrawal of a government-guaranteed 200-million-dollar operating loan forced the Penn Central to file for bankruptcy protection on June 21, 1970. The Penn Central raillines were then divided between Conrail and Amtrak. The Pennsylvania Railroad's corporate symbol was the keystone, which is Pennsylvania's state symbol, with the letters PRR intertwined inside. When colored, it was bright red with silver-grey molding and lettering. The Commonwealth of Pennsylvania, as part of the Main Line of Public Works, chartered the Pennsylvania Railroad in 1846 to build a rail line that would connect Harrisburg to Pittsburgh. This western line from Harrisburg would complete the main line, which was to be a railroad and canal corridor across the state. Work on the western part of the main line was completed in 1854 and rail service from Philadelphia across the state to Pittsburgh was available. In 1857 the PRR purchased the main line from the State of Pennsylvania. This line is still an important cross-state corridor, composed of Amtrak's Philadelphia to Harrisburg Main Line and the Norfolk Southern Railway's Pittsburgh Subdivision. In the early 1860s, the PRR gained control of the Northern Central Railway, giving it access to Baltimore, Maryland along the Susquehanna River via connections at Columbia, Pennsylvania or Harrisburg. On December 1, 1871, the PRR leased the United New Jersey Railroad and Canal Companies, which included the original Camden and Amboy Railroad from Camden, New Jersey (across the Delaware River from Philadelphia) to South Amboy, New Jersey (across Raritan Bay from New York City), as well as a newer line from Philadelphia to Jersey City, New Jersey, much closer to New York, via Trenton, New Jersey. Track connection in Philadelphia was made via the United Companies' Connecting Railway and the jointly owned Junction Railroad (Philadelphia). The PRR's Baltimore and Potomac Rail Road opened on July 2, 1872, between Baltimore, Maryland and Washington, D.C. This route required transfer via horse car in Baltimore to the other lines heading north from the city. On June 29, 1873, the Baltimore and Potomac Tunnel through Baltimore was completed. The PRR initiated the misleadingly named Pennsylvania Air Line service via the Northern Central Railway and Columbia, Pennsylvania. This service was 54.5 miles (87.5 km) longer than the old route but avoided the transfer in Baltimore. The Union Railroad (Baltimore) line opened on July 24, 1873. This route eliminated the transfer in Baltimore. PRR officials contracted with both the Union Railroad and the Philadelphia, Wilmington and Baltimore Railroad (PW&B) Railroad for access to this line. The PRR's New York–Washington trains began using the route the next day, ending Pennsylvania Air Line service. In the early 1880s, the PRR acquired a majority of PW&B Railroad's stock. This action forced the Baltimore and Ohio Railroad to build the Baltimore and Philadelphia Railroad to keep its Philadelphia access, where it connected with the Reading Railroad for its competing Royal Blue Line passenger trains to reach New York. In 1885, the PRR began passenger train service from New York City to Washington, D.C. with limited stops along the route. This service became known as the "Congressional Limited Express." The service expanded, and by the 1920s, the PRR was operating hourly passenger train service between New York and Washington. In the early 1950s, 18-car stainless steel streamliners were introduced on the Morning Congressional and Afternoon Congressional between New York and Washington, as well as the Senator from Boston to Washington, D.C. In 1912, the "Broadway Limited" was started. This train ran from New York City to Chicago, via Philadelphia, with an additional section between Harrisburg and Washington (later operated as a separate Washington–Chicago train, the Liberty Limited). The Pennsylvania and Newark Railroad was incorporated in 1905 to build a low-grade line from Morrisville, Pennsylvania to Colonia, New Jersey. It was never completed, but some work was done in the Trenton area, including bridge piers in the Delaware River. North of Colonia, the alignment was going to be separate, but instead two extra tracks were added to the existing line. Work was suspended in 1916. Early in the 20th century, the PRR began construction to electrify some of their rail lines. The initial construction was in the New York terminal area, including some of the tunnels. This was a direct current (DC) low-voltage system that supplied power through a third rail. The system was put into service in 1910. The next area to be electrified was the Philadelphia terminal area. After researching and experimenting with different power systems, PRR officials decided to use overhead trolley wires to supply power to the trains. Unlike the New York terminal system, the overhead wires would carry high-voltage alternating current (AC) power. This became the type of system used for all future installations. In 1915, electrification of the line from Philadelphia's Broad Street Station to Paoli, Pennsylvania was completed. Other Philadelphia lines electrified were the Chestnut Hill Branch (1918), White Marsh (1924), West Chester (1928), and in 1930 the Norristown branch along with the main line to Trenton, New Jersey. PRR's president William Atterbury announced in 1928 plans to electrify the lines between New York, Philadelphia, Washington and Harrisburg. In January 1933, through main-line service between the principal cities was placed in operation. The first test run of an electric train between Philadelphia and Washington occurred on January 28, 1935. On February 1 the Congressional Limiteds in both directions were the first trains in regular electric operation between New York and Washington, drawn by the first of the GG1 type locomotives. All regular passenger trains between these cities were electrified by March 15, and shortly thereafter through trains to the west were electrically operated from New York City to Paoli, Pennsylvania. In 1849, PRR officials developed plans to construct a repair facility at Altoona. Construction was started in 1850, and soon a long building was completed that housed a machine shop, woodworking shop, blacksmith shop, locomotive repair shop and foundry. This facility was later torn down to make room for continuing expansion. In time additional PRR repair facilities were located in Harrisburg, Pittsburgh, Mifflin, and Juniata, Pennsylvania. Alexander Graham Bell sent two assistants to the Altoona shops in 1875 to study the feasibility of installing telephone lines. In May 1877, telephone lines were installed for various departments to communicate with one another. By 1945 the Altoona Works had grown to be one of the largest repair and construction facilities for locomotives and cars in the world. During World War II, PRR facilities (including the Altoona Shops) were on target lists of German saboteurs. They were caught before they could complete their missions. Cite error: Closing </ref> missing for <ref> tag Use of the testing facilities were discontinued in 1968 and many of the structures were demolished. On February 1, 1968, the PRR merged with arch-rival the New York Central railroad to form the Penn Central. The ICC required that the ailing New York, New Haven & Hartford Railroad be added in 1969. A series of events including inflation, poor management, abnormally harsh weather conditions and the withdrawal of a government-guaranteed 200-million-dollar operating loan forced the Penn Central to file for bankruptcy protection on June 21, 1970. The Penn Central rail lines were split between Amtrak (Northeast Corridor and Keystone Corridor) and Conrail in the 1970s. After the breakup of Conrail in 1999, the portion which had formerly been PRR territory largely became part of the Norfolk Southern Railway. 1846 The Pennsylvania Railroad is chartered to construct a rail line from Harrisburg to Pittsburgh. 1850 Construction started on repair shop at Altoona. 1860-1890 PRR expands throughout the U.S.
1885 The "Congressional Limited Express" from New York City to Washington D.C. is introduced. 1894 The Pennsylvania Pacific Corporation is formed by the PRR. 1910 New York terminal and tunnels are electrified. 1915 PRR electrifies its suburban Philadelphia lines between Central Philadelphia and Paoli. 1916 PRR adopts new motto, "Standard Railroad of the World". The first I1s "Decapod" locomotive is completed, and switching locomotives of the A5s and B6sb class are introduced. 1918 PRR stock bottoms at $40¼, the lowest since 1877, due largely to Federal railroad control. Emergency freight is routed through New York Penn Station and the Hudson tunnels by the USRA to relieve congestion. Locomotive class N1s is introduced for PRR's western lines. The PRR electrifies the suburban Philadelphia commuter line between Central Philadelphia and Chestnut Hill. 1928-1938 PRR electrified its New York–Washington main line, the Chicago–Philadelphia main line between Harrisburg and Paoli, several Philadelphia and New York area commuter lines, and major through freight lines. 1957 Steam locomotives are removed from active service in the PRR fleet. 1968 Pennsylvania Railroad merges with New York Central to form the Penn Central. 1970 The Penn Central files for bankruptcy protection on June 21, 1970. The Pennsylvania Railroad, as the "standard railroad of the world", also strove for an air of permanence, decorating its railroad stations with symbols of itself such as the Pennsylvania Herald, shown above at Newark Penn Station. In 1916 the PRR began using the slogan: Standard Railroad of the World. This meant that it was perceived as the standard to which all other railroads aspired. For a long time this was true, the PRR had an impressive list of firsts, greatests, biggests, and longests. The PRR was the first railroad to completely replace wooden-bodied passenger cars with steel-bodied cars. Over its history it led the way in many safety and efficiency improvements. In later years the PRR abandoned the use of the slogan. The Pennsylvania Railroad was "standard" in another way. It was an early proponent of standardization. While other railroads used whatever was available, the PRR tested and experimented with equipment designs. When they found the right design, it became standard across the whole company. This gave the railroad a feel of uniformity, and it also reduced costs. This was unlike other railroads who purchased locomotives and railroad cars in small lots, taking whatever was available from manufacturers at the time. The PRR was also an early adopter of standard color schemes for their equipment. The Pennsylvania Railroad was one of the first railroads to use position-light signals trackside. The signals were designed to replace semaphore signals. Visibility in foggy conditions was one of the factors for the development of this type of signal. A position-light signal used a large round target (sign) with an array of up to nine lights. Eight lights are arranged in a circle near the edge of the target with another light positioned in the center. The lights in position-light signals used amber-colored lenses, which could penetrate fog. With a position signal light, the positioning of the light display determined the meaning of the message. The design also allowed train personnel to recognize the signal aspect even when one light in a row was inoperative. Signal aspects were displayed as rows of three lit lights. These signal aspects corresponded with upper-quadrant semaphore signal positions: vertical display for proceed, a 45° angle display for approach, and horizontal display for stop. Additionally, a row of lights at a 45° angle leaning left of vertical (perpendicular to the approach aspect) was also used for a restricting aspect. A "X" shape was a "take siding" aspect (message) and a full circle was a "raise pantograph" aspect in electrified territory. Additional aspects were conveyed with a second target head below the first, either a single light, a partial target, or a full target, depending on the location. PRR I1sa #4483 on display at Hamburg, New York. K4s at Aberdeen, Maryland April 26, 1944. 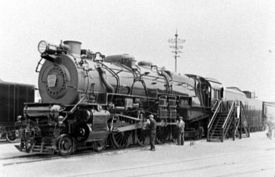 For most of its existence, the PRR was conservative in its locomotive power choices and pursued a path of standardization, both in locomotive types and their component parts.Almost alone among American railroads, the PRR designed most of its steam locomotive classes itself and built a proportion of them in its Altoona Works. The PRR is believed to have been the 4th-most prolific U.S. builder of steam locomotives. Outside builders were used due to the sheer number of locomotives the PRR ordered. The number required exceeded the capacity that its own shops could produce. PRR used a commercial builder as a subcontractor, building exact replicas of an existing PRR design. This was unlike most railroads who gave only a broad specification, thereby leaving the majority of the decision making and design to the locomotive builder. When it needed to use a commercial locomotive builder, the PRR favored Philadelphia's Baldwin Locomotive Works. Baldwin was a major PRR customer, receiving its raw materials and shipping out its finished products on PRR lines. Moreover, the two companies were headquartered in the same city, with PRR and Baldwin management, along with the engineers, knowing each other well. When both the PRR and Baldwin shops were at capacity, orders went to the Lima Locomotive Works in Lima, Ohio.Cite error: Closing </ref> missing for <ref> tag Early on, this was simply an alphabetical letter, but when these began to run out, the scheme was changed so that each wheel arrangement had its own letter, and different types of the same arrangement were defined by a subsequent number. Subtypes were in turn indicated by a lower-case letter; superheating was designated by an "s" until the mid 1920s, by which time all new locomotives were superheated. Thus, for example, a K4sa class was a 4-6-2 "Pacific" type (K) and of the fourth class of Pacifics designed by the PRR. It was superheated (s) and was of the first variant type (a) after the original (unlettered). See PRR locomotive classification for details. Steam locomotives remained part of the PRR fleet until 1957 when they were retired from active service. It should be noted that the PRR's reliance on steam locomotives in the mid 20th century was a factor contributing to its downfall. Steam locomotives require more maintenance than diesel locomotives, are less cost efficient, and requires more personnel to operate. Also, the PRR was unable to update its fleet during the World War II years, and by the end of the war their fleet was in rough shape. The PRR's competitors managed this period better with their diesel locomotive fleets. The PRR was historically-minded when it voluntarily preserved a roundhouse-full of representative steam locomotives at Northumberland, PA in 1957, and kept them there for several decades. These locomotives are now at the Pennsylvania State Railroad Museum in Strasburg, PA, for all to see. In sharp contrast, the New York Central's Alfred E. Perlman deliberately scrapped all but two large NYC steam locomotives...and these survived only by accident and sheer luck. On December 18, 1987 the State of Pennsylvania designated the Pennsylvania Railroad's K4s as the official State Steam Locomotive. Examples can be seen on display at museums in Altoona and Strasburg, Pennsylvania. When the work on the Hudson River tunnels and Pennsylvania Station was in progress, the type of electric locomotives to be used was an important consideration. At that time just a few electric locomotives had been built anywhere. 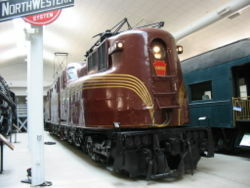 Several experimental locomotives were designed by railroad and Westinghouse engineers and tried on the West Jersey track. From these tests the DD1 class was developed. The DD1s were used in pairs (back to back). Thirty-three of these engines having Westinghouse equipment were built at Altoona. They were capable of speeds up to 85 miles per hour. Placed in service in 1910, they proved to be very efficient. Various types of locomotives were being designed for the long-range electrification program. The first equipment to be put into service consisted of 93 motor cars, and by 1924 there were 286 cars of this type in use. By 1935 the motor and trailer equipment totaled 43 units, with the number eventually reaching 524 units. The most powerful single-unit electric locomotive ever built was tried in 1917 and used experimentally for a number of years. This engine was classed the FF1 and had a side-rod drive. This class developed a tractive force of 140,000 pounds. In 1924 another type of side-rod locomotive was designed (the L5 class), and three engines were built. Two were DC engines for use in the New York electrified zone and the third, road number 3930, was AC-equipped and put in service at Philadelphia. Later, 21 more L-5 locomotives were built for the New York service. A six-wheeled switching engine was the next electric motive power designed, being classified as B1. Of the first 16 AC engines, two were used at Philadelphia and 14 on the Bay Ridge line, while 12 DC-equipped engines were assigned to Sunnyside Yard. The O1 class was a light passenger type. Eight of these engines were built from June 1930 to December 1931. The P5 class was also introduced, with two of this class being placed in service during July and August 1931. Following these came the P5A, a slightly heavier design capable of traveling 80 miles per hour and with a tractive force of 56,250 pounds. In all, 89 of these locomotives were built. The first had a box cab design and were placed in service in 1932. The following year, the last 28 under construction were redesigned to have a streamlined type of cab. Some of these engines underwent regearing for freight service. The PRR built several grand railroad passenger stations in major cities, either alone or in conjunction with other railroads. These architectural marvels served as the hubs for the PRR's extensive passenger service. Many of these stations are still in use today, served by Amtrak as well as regional passenger carriers. See also Pennsylvania Station, the name given to many of them. Union Station served as a hub for PRR passenger services in the nation's capital, with connections to the Baltimore and Ohio Railroad, and Southern Railway (US). The Richmond, Fredericksburg and Potomac provided a link to Richmond, Virginia, about 100 miles to the south, where major north–south lines of the Atlantic Coast Line Railroad and Seaboard Air Line Railroad provided service to the Carolinas, Georgia, and Florida. The original Pennsylvania Station was modeled on the Roman Baths of Caracalla; it was notable for its enormous rail shed and its infamous demolition in the railroad's waning years. The station was built in 1910 to provide direct access to Manhattan from New Jersey without having to use a ferry, and was served by the PRR's own trains as well as those of the PRR's subsidiary the Long Island Rail Road. Its 1963 demolition did not, however, extend to the platforms, the tracks, or even some of the staircases. This recently refurbished station was built in the 1930s as part of the PRR's Northeast Corridor infrastructure. Its style is a mixture of Art Deco and Neo-Classical. Amtrak still makes stops here, however this station mainly serves as a stop for three commuter lines. In classical grandeur, the 30th Street Station displays its majestic—and traditional—architectural style with its enormous waiting room and its vestibules. The station, in spite of its apparent architectural classicism, was constructed in the 1930s, when moderne and art deco styles were more popular. The Pennsylvania Railroad, along with the Milwaukee Road and the Burlington Route, built Chicago's Union Station, the only one of Chicago's old stations to still exist as a train station (the rest of Chicago's operating passenger stations have been substantially remodeled). It was designed by Graham, Anderson, Probst & White in the Beaux-Arts style. Starlight Express, a railway musical in which two characters are from the Pennsylvania Railroad. Atterbury-Bakalar Air Museum (2000), General Atterbury. Retrieved February 21 2005. Rensselaer Polytechnic Institute (2005), RPI: Alumni hall of fame: Alexander J. Cassatt. Retrieved February 22 2005. President and Fellows of Harvard College (2004), 20th century great American business leaders - Martin W. Clement. Retrieved February 23 2005. Thomas, William G. "The Countryside Transformed:The Eastern Shore of Virginia, the Pennsylvania Railroad and the Creation of the Modern Landscape" Southern Spaces July 31, 2007. White, John H., Jr. (Spring (season) 1986), America's most noteworthy railroaders, Railroad History, Railway and Locomotive Historical Society, 154, p. 9-15. ↑ Pennsylvania Railroad Company Inspection of Physical Property Board of Directors (November 10-11-12, 1948). Retrieved on 2007-08-27. ↑ The Erie Lackawanna Limited - The Pennsylvania Railroad. Retrieved on 2007-08-27. ↑ 3.0 3.1 Railfan's Guide to the Altoona Area. www.trainweb.org. Retrieved on 2007-08-24. ↑ Chapter 1: History of the Altoona Railroad Shops Heading 14. The Elimination Of the Older Railroad Shop Buildings In The 1960s And After paragraph 6. National Park Service Special History Study. United States National Park Service (2004-10-22). Retrieved on 2007-08-21. ↑ History of the Altoona Railroad Shops: The Creation And Coming Of The Pennsylvania Railroad. National Park Service Special History Study. United States National Park Service (2004-10-22). Retrieved on 2007-08-21. ↑ PRR Chronology 1871. PRR Research. Philadelphia Chapter Pennsylvania Railroad Technical & Historical Society (January 2005 Edition). Retrieved on 2007-08-27. ↑ William W. Kratville, Steam, Steel & Limiteds. Omaha, Neb. : Barnhart Press, 1962. ↑ The Congressionals and the Senator. www.steamlocomotive.com. Retrieved on 2007-08-28. ↑ 9.0 9.1 9.2 9.3 9.4 9.5 Pennsylvania RR Electrification. Northeast Railfan.net. Retrieved on 2007-08-25. ↑ History of the Altoona Railroad Shops Chapter 1 Heading 7 The Altoona Railroad Shops After The Civil War Paragraph 10. National Park Service Special History Study. United States National Park Service (2004-10-22). Retrieved on 2007-08-21. ↑ [http://www.nps.gov/history/history/online_books/railroad/shs4.htm Chapter 4: Significance and Recommendations for Future Research 1. Significance of Altoona Works]. National Park Service Special History Study. United States National Park Service (2004-10-22). Retrieved on 2007-08-21. ↑ 14.0 14.1 14.2 14.3 14.4 14.5 February 2006 Meeting. Rivanna Chapter National Railway Historical Society Charlottesville, Virginia (January 15, 2006). Retrieved on 2007-08-31. ↑ Fischer, Ian S.. "PRR Color Guide to Freight and Passenger Equipment". Morning Sun Books. ↑ Roy's Super Toy Shop presents PRR Steam. Roy's Super Toy Shop. Retrieved on 2007-08-26. ↑ PRR Signals. Philadelphia Chapter Pennsylvania Railroad Technical & Historical Society. Retrieved on 2007-08-24. ↑ Pennsylvania Railroad Mikados. Steam Locomotive.com (February 8, 2007). Retrieved on 2007-08-31. ↑ Hello Pennsylvania - State Symbols. Commonwealth of Pennsylvania. Retrieved on 2007-09-01. ↑ Ztrains The PRR Class GG1. www.ztrains.com. Retrieved on 2007-08-26. PennsyRR.com - comprehensive PRR facts and history site, comprising multiple individual websites. prr.railfan.net - contains a lot of PRR information, including equipment diagrams, freight car info. This page was last edited on 18 December 2007, at 14:57.